The King of Rain Dance finally makes our Countdown. Blastoise was an extremely popular card in decks in 1999/2000 due to his abusable Pokemon Power: Rain Dance. Rain Dance decks and Haymaker decks dominated the tournament scene in the early days of Pokemon. In 2017, this copy of Blastoise sold for $9000. First Edition Base Set Rare cards can command ridiculously high prices if they’re graded Perfect 10’s. We also saw several other sales of Blastoise in the $6,000 to $7,500 range. 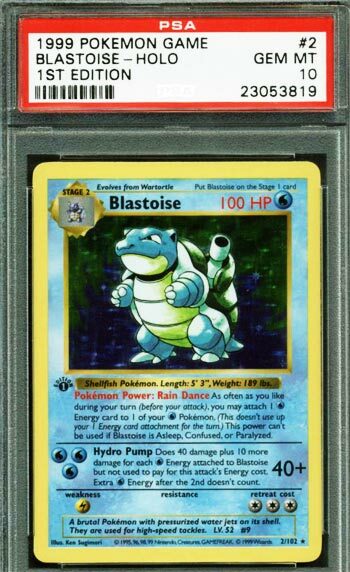 Of the Big 3 (Charizard, Venusaur and Blastoise), there are less 1st Edition PSA 10’s of Blastoise (83) in circulation than either Charizard (115) or Venusaur (102). Maybe that’s because Blastoise was getting used a whole lot more in tournaments than those other cards. Then again, Charizard has been submitted for grading twice as many times as well.